This month florists across the world have sent out thousands of bouquets filled with roses and carnation and orchids and lilies for honoring a special day for their Mums’… Mother’s day. It has slowly overtaken Valentine’s Day in terms of volumes of flowers in newer markets around the world. Yet, there are many florists who will suffer losses while adding to their turnover because of the impact of the “Online Florist” a term, which is very deceptive. It is deceptive to both, the end consumer, who pays for the bouquet as well as the receiver who does not quite know what is the value of what she or he is receiving. As I write this, many neighborhood florist shops are well on their way to closing business, shops they have sometimes run for over a couple of generations. Yet the ones who are online will survive. Recessions may be a reason, alternative gifts may be another reason and high rentals in high streets may be the final coffin on the neighborhood florist? Perhaps, but the real reason is, as most florists say their biggest challenge is a behind-the-scenes margin fight that plays out every time a buyer goes online to arrange a flower delivery. So what or who is a real “Online Florist” and how should a buyer, browsing for a good bunch of fresh flowers to send to loved ones understand how to pick the best online florist? Do not use common search terms like “bouquet to XYZ city” or send flowers, or flower delivery. Search for the local area that you want to send to and especially Google Local Business searches. This will help you to locate a proper florist who will deliver fresh flowers directly from his flower shop and not an e-commerce portal who is simply an aggregator and not really a florist. An aggregator simply takes your order and passes on the order to any florist, mostly the cheap ones without reputations since there is no branding that they have to worry about. Most of the money is kept with the aggregator; the flowers are barely ¼ of the real price and sometimes even less. 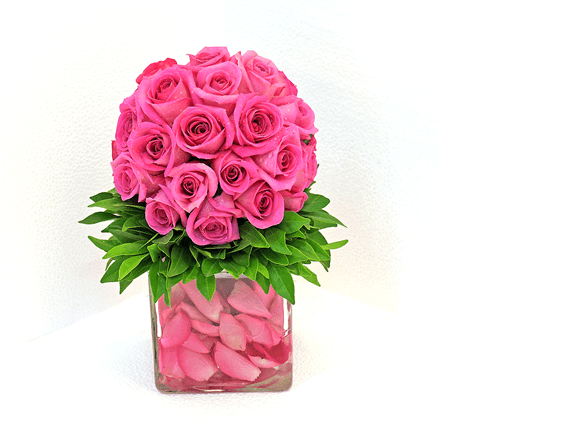 Always check out the “contact us” page of the florist website you want to order from. If there is just a telephone number without a location, a physical address, it is best to avoid this website. Mostly this will be a fly by night operator who has simply put up a website, with bouquets and gifts and using black hat SEO techniques has risen to the top page ranking. Google will soon extinguish such a florist, but this kind of website manages to cheat and fool many consumers. Beware; your flowers might not reach at all. If you have followed my tips above you will reach a good local florist website that is closer to your recipient’s delivery area. This is a sure fire way of ensuring that delivery is quickly taken care of especially if it is the same day or next day delivery. Another good tip while ordering flowers through local online florists is to give a florist a couple of days so that the flowers you select can be ordered and made as per design presented. The more time you give a florist to prep an order, the more it will look like the picture presented. I am sure many of you face this dilemma while placing online bouquet orders. What you ordered for and what is received is quite different. When you have the same day delivery or just a next day delivery, check on the local florist website if there is any special choice for easy same day delivery. This means the florist keeps in stock, these particular flowers and colors daily. This will ensure that your recipient will get sent the same flowers, color and type as what you order. One last tip is to leave the design to a reputed florist website, as a “customized design” there is a better chance of getting more bang for your buck. The floral designer will then have the chance to use combinations of colors and flowers which are nice and fresh and in abundance in her or his shop and finish beautiful designs with a flourish. Do believe me on this tip because I am a florist with an online presence and I thoroughly enjoy it when my customer tells me, just do what you do best! Here are some of my designs which are easy to order and always available online for delivery. A beautiful topiary style yet a desktop size, easy to deliver and easy on the budget. The pink floating petals are what add to the stunning effect of this floral design. An unusual way of presenting the fabulous and eternal red rose. 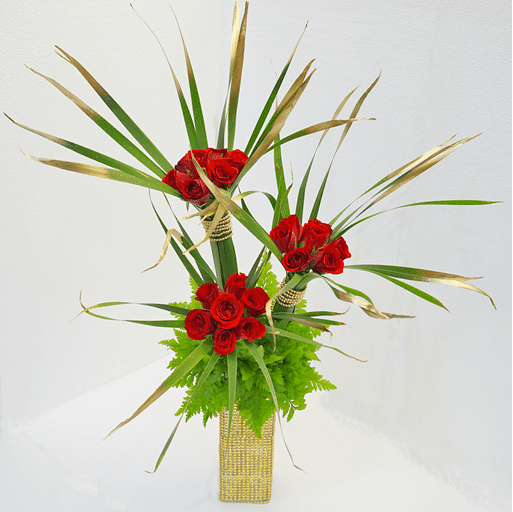 Using a gold theme with red roses, I have added gold diamante to the vase below and balanced it with palm leaf fronds sprayed gold holding a bunch of red roses together. This can be a perfect Holiday Season’s Greeting with red, green and white colors. 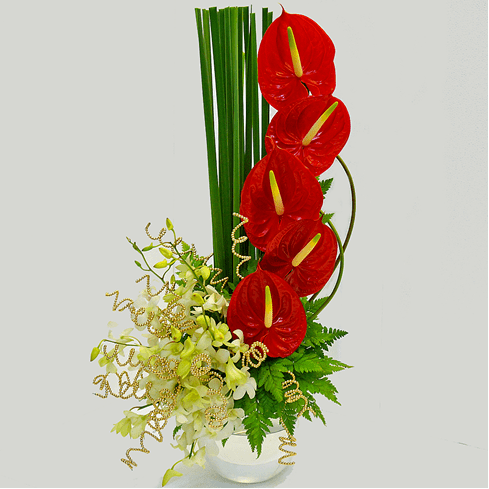 Red anthuriums are long lasting tropical flowers and combining them with white orchids and swirls of gold make it a stunning gift for a celebration. Today the world is a global marketplace and gifts like flowers are most needed as families and corporations are spread across the globe. What better way than to send flowers through an online florist. Just follow some basic tips as mentioned above and you will always have a happy person receiving those flowers from you.